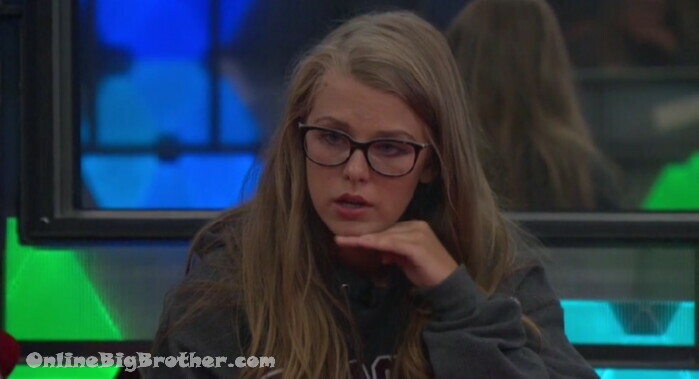 Big Brother Spoilers – Tyler or JC one of those will be Haleigh’s treat but of course the hacker and Veto can change all of this. Also keep in mind that Tyler has the Cloud app. If the Hacker compe and Veto don’t go Level 6’s way he pops the cloud app before the Veto ceremony and he’s save from the backdoor. 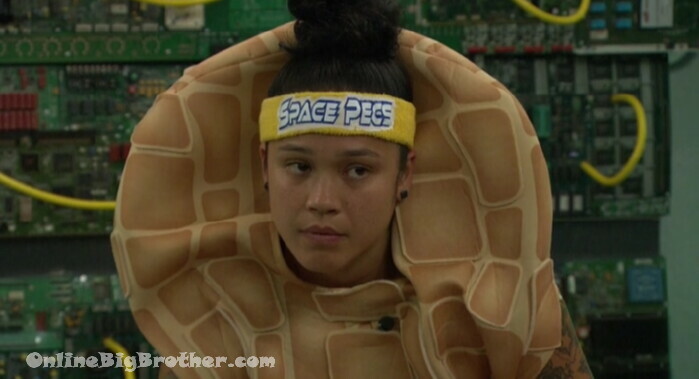 Angela – we can hangout in public now..
Kaycee says Scottie is in their ear..
T – whats the Hacker plan..
Angela – I don’t know..
T – take one of us off..
T – for god sake I’m a peanut..
Kaycee – you turned me into a peanut you put me up as a peanut it’s war..
Kaycee – yeah she is she;’s f*ing with our game..
k – We’ll figure it out..
Kaycee – f*ing Sam dude..
Kayce e- F*ing Sam.. Sam put her a$$ up and f*ing rockstar.. like.. but probably because she vote bayleigh and was an emotional wreck. Kaycee – Scottie has been in their ear..
T – we’ll be fine.. i’ll be fine..
A – we don’t talk game.. and that I thought she was the hacker and I’m coming after her after I told her I didn’t think she was the hacker..
A – Sam asked to be on the block..
Tyler says he promises them these nominations were there to backdoor him. A – we have to win hacker..
Angela says JC might get caught in a lie and get backdoored. Angela says she still thinks the hacker was bayleigh..
kaycee – you f*ed with the wrong peanut.. you put the peanut up with my sister.. They are talking about allainces that JC has told them about.. comparing notes abnout JC. Fes – bayleigh made a top three with him without me being there.. why would Bayeligh do that..
Ha – to cover all angels..
Scottie people are trying to f* with us..
FEs – it’s not people it’s one person who is that one person..
Fes – what is JC doing.. 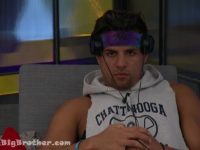 ROCKS – keep him at an arms distance..
Ha – listening when he has something to come to me with..
Haleigh says they reevaluate what he says and figure out what is bullsh1t. fes says JC has been planting seeds in his head. Bring sup that when bayleigh won HOH he kept repeating to him how much he loved bayleigh. Rocks – he’s actually a genius do you know he’s like a lawyer..
Fes – you ready for that hacker comp..
Brett says he’ll keep the noms the same if he wins the Hacker. Haleigh is happy that is what she wants. Invites Brett to hang out with them. A – I don’t think we should put ROCK up I think we should put Sam up.. becuase .. lets say me and Sam are oin the block SAm is goign to be like vote me out… vote me out..
A – it needs to be Sam and one of us on the block..
K – there’s a much better chance that we all stay if sam goes up .. she’ll be like vote me out vote me out..
A – if it’s me a rocks .. lets go through the votes .. you, Tyler, BRett, JC, VS Sam, Scottie, FEs .. wait..
they got over their math..
A – it would be easier to campaign against SAm.. Sam wants to go home I want to be here..
A – if we don’t win the hacker we don’t have the numbers because they are going to delete one of our votes. Kaycee – ROCK is a solid vote on their side.. Sam I feel like sh’es not fully flipped.. you know what I’m saying.. ROCK(head) is a solid vote. LOL kaycee just asked her that… they laugh.. I laugh..
Kaycee – I think Sam is the better replacement..
Kaycee – I feel like Sam will vote out ROCK over me.. I feel pretty confident..
Kaycee now saying they need to put ROCK up because that way it’ll be only Scottie and Fes on that side voting to keep ROCK. Angela says she still thinks Sam will scream send me home if on the block but recognizes that’s going out on the limb. 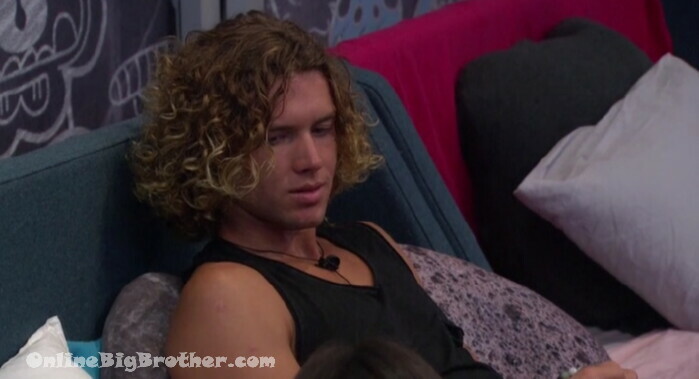 Angela – all we have to do it plant some seeds in Sam’s head..
they now agree ROCKS goes up if they win Hacker. A – Right now I feel more safe on the block than off.. They agree they have to win Hacker to keep level 6 safe..
Kaycee – we got to put ROCK up because she’s a solid for them. They go through all the permutations .. If they win hacker and veto then the other side loses a member. Tyler tells them Sam will keep KAycee over the ROCK and THE ROCK over Angela. T – she’ll try to backdoor me but I can get out of that ..
Tyler doesn’t think the hacker will put him up because that would guarantee he plays in the veto. Tyler is going to get closer to Sam to secure her vote. 1:23pm Feeds go down for hacker competition.. Hoping Level 6 can win the hacker comp and hack Hayleigh’s reign the way she hacked Angela’s. you mean completely ineffectively so that the hoh’s backdoor plan still comes to pass? i’m rooting for a floater to win it and not use it. i want the house to be 3 L6, 3 hive, and 3 floaters. I wouldn’t have thought Sam liked Tyler more than a friend, but she was weird last night on After Dark. She was really friends and fond of both Angels and Tyler, so why would she react so negatively when Angela saved Tyler? Wouldn’t she be happy? And last night she cried so much and specifically said she wanted them both out. Makes no sense. All season, she has isolated herself in the kitchen, saying she doesn’t want to talk game. Now that’s the very thing she is blaming L6 for… They don’t talk game to her and leave her or. How many times has she said “I don’t want to know!” Why does she suddenly have affection for Rock bottom and Bay? Bay was a lunatic while on the block and a tyrant while HOH. This is not strategy. For some reason, she’s breaking down over something having to do with Tyler and Angela. Doesn’t make sense unless she had feelings for Tyler. Your last line sums it up. Sam always said Tyler was her number one and when Angela saved Tyler with her veto Sam’s jealousy came out. Sam wants to be Tyler’s number one and she isn’t. Tyler likes or loves them all, but nobody is his favourite. Tyler is looking to win not make friends. Friends are a bonus but his number one priority is to win. That really is the only explanation. It would be something else possible if she had turned on only one of them but the fact that she flipped specifically on those two, that’s the only thing I can come up with. And you don’t fall apart like that if your friend spends a little extra time with someone else … i.e. Fezzy stalking Haileigh when she talks to other guys. Sam’s behavior is like a scorned lover. Don’t piss off a welder! A lot riding on this hacker comp. It would be hilarious if L4 wins it! Another week of the clueless hive trying to figure what went wrong. Brett seems to be skating by this week. No one focused on him. Good for him! Hay is really trying to work this out to evict Tyler. IMHO, she is the only one in the hive with a brain. Scotty is just too unreliable. Unfortunately, Tyler has the cloud app & will play it so Hay will not realize her goal. I think that if L4 doesn’t win the veto, Angela get to go live with Bay in the “little house”. Yikes!!!! Would love to see that reunion! 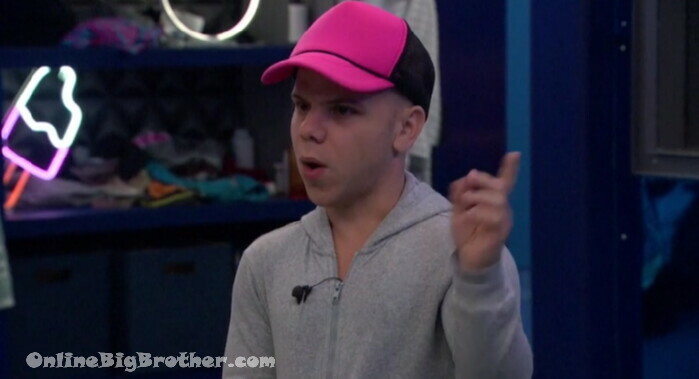 If L4 wins hacker & veto….Fez will go. Fez is dangerous only because he has won 2 vetos. The rest of them (minus Hay) can’t win anything. Scotty has come close but if L4 has the power…he will go running back to them. I can’t figure out what the heck Sam is doing. Tyler may be right but I don’t know. Is production poking their sticky finger in her DRs & getting her all crazed? Or is she playing the hive in order not to get nominated? Or has she just gone round the bend? I have no idea what is going on in Sam’s head but I do agree with you that this season has been awesome. 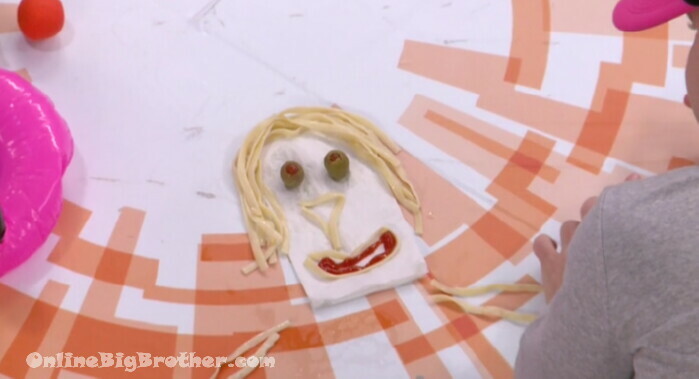 Fes has won 2 veto and scottie won an hoh.. I disagree about Fezzy leaving, I (they) should backdoor Scottie. JC and Sam love Fessy. They will not vote him out if he is the replacement nominee by the hacker. I’ll give ya props for that thea. I didn’t see it weeks ago. I seriously didn’t pick up on that like y’all did (“DON’T SAY Y’ALL!!!!). But you must be right. It wasn’t them crawling all over the guys,, it was Kaitlyn crawling all over Tyler. And what’s even more bizarre is that Bayleigh’s meltdown seemed to be more about Tyler dissing her (in her mind) than Angela calling her the hacker. I had flashbacks to Chima imploding over Russell. That’s 3 women who’ve lost their freaking mind over Tyler aka sweet baby bird. And even stone cold Angela seems to be enamored with him. He must smell like the ocean or something! ??? I think odds are Angela, JC, Brett or kaycee are going this week. Tyler has too much power to go you better believe if he or someone from his alliance doesn’t win that Hacker app he’s using that app to not go up as a replacement. I think Angela’s going! haha the picture of Baleigh and Angela in the jury house is funny! Nicole, I was thinking the same thing! If Angela is the next to go to jury, then she and Bay have a full week to hang out together. I would almost want feeds from the jury house for that one. angela is definitely in the worst spot. it all comes down to who ends up being the nominees on eviction night. the hacker could send one of hay’s side home, but i think if the noms stand then angela is out, really could be anyone though until post-hacker. Did Haliegh get a penalty for eating her fingernails during slop week? Thank Goodness!!!! The Hive has started figuring things out and comparing notes. I hate to say it but Bayleigh might have been previously clouding their judgements. Get Tyler or Angela add out of the house. i definitely think bayleigh was preventing them from seeing straight. Tyler running level 6 & they don’t even know it. Kaycee will do whatever she is told by her alliance, she doesn’t have her own game & neither does Angela. Like I said Tyler or Scottie gonna win this season. Rocks saying that JC is a lawyer. Why does this feel eerily familiar? Oh, that’s right. Winston was a doctor. I guess the next one will be Tyler is actually the Secretary of State. Tyler tells the girls that she will try to backdoor him but he has a way out of that…AND NOBODY QUESTIONS HIM ABOUT IT. Exactly. And the other night he was saying basically the same to Kaycee and I think she said what or something. He repeated it. Something similar. And she never questioned it. I thought he was about to tell her. Someone came in right after. How are they not understanding. Knowing there is another power. And it just goes straight over their heads. Sounds like Brett should be nervous. Haleigh is way too into Brett to put him on the block. She may have voted to evict him when he was already on the block (and she had to stay in with her alliance), but she would never put him up herself. She seems far more attracted to him than Fes. She flirts with both, but her attraction to Brett is for real and he’s working it. Simon I loved your comment when Angela and KC said they’d put up the Rocks if they didn’t win the hacker comp lol! You are toooo funny! Tyler should consider backdooring the girls, not the other way around…. The L6 Catch phrase of the week…..
Can we just admit right now…like this page has been saying about Foutte for who knows how long…That L6/5/4 are idiots too? They aren’t any smarter then the other side. And I have disliked that sneaky little weasel since day one. Interesting that both sides of the house are “suddenly” realizing JC is a manipulator. And at the very same time!!! JC must has pissed off someone in production and they ratted him out. He could be toast next week. I really want to see him freak out like Sam or Bay. I think the little guy really could have a meltdown when people turn on him. I think it’s more that they need someone outside any alliance to target because things are very shaky right now. Kacey won the Hacker power. JC the super rat is making himself so obvious now. I will be cheering when L6 dispose and toss him in the garage. Do we know why hay,fes & scottie voted bay out instead of rockstar? Sorry if this has been discussed already. Seems like the worst alliance in bb history made another horrible move. Rockstar was going to be staying in the house and is their team mate. Bay was a lost cause. Maybe RS feels better getting supporting votes so why not? It was a nice move. With Kaycee winning the hacker app and replacing herself with Rock(head) lol, all I see is Tyler winning the veto, taking off Ang, and jc going up on the block and out the door. Is it just me or does Sam confuses the %@&$ out of you all too? For sure Sam has a thing for Tyler; when she put up the girls and used that “you aren’t feminist” crap, it really was “you’re hugging on my dude”. She was jealous. “Babes…total babes in my book. Well there’s coffee…you’ll need it.” Brett is the best!! !